In every presidential election since exit polling began over forty years ago, Democrats have performed stronger among women than men, while Republicans performed stronger among men than women. Of the eleven elections since 1972, Democrats have lost the female vote in four (1972, 1980, 1984, & 1988), all of which resulted in electoral landslide defeats for their party. The same is true for the three of eleven elections (1976, 1992, and 2008) where Republicans lost the male vote. While the difference in voting patterns between the sexes is clear, the extent of that difference has varied widely throughout the years. In the most recent presidential election, the Democratic incumbent carried women by eleven points, while the Republican challenger carried men by seven, creating a gender-gap of eighteen points. But in 1976, when Democratic challenger Jimmy Carter defeated President Ford, the gap was less than ONE point. In 1972, when Nixon won reelection in a landslide, the gender gap was only three points. The largest gender gap recorded by exit polling came in the 2000 election, where Gore carried women by ten points, while Bush carried men by eleven. Yet in an election year where the most likely Republican nominee happens to have a knack for disparaging women, and where the probable Democratic nominee elicits an almost instinctual disdain from her male detractors, you have the recipe for a gender-gap explosion that could make the 2012 election, or even the 2000 contest, seem tame. In fact, if current polling is any indication, that's exactly where we are headed. From Mitt Romney's past dalliance with government healthcare and abortion, to John McCain's involvement with campaign finance and immigration reform, strict purity to conservative orthodoxy has never been a Republican prerequisite for the presidential nomination. But if Romney and McCain flirted with expanding the bounds of acceptable disobedience to GOP principles, Donald Trump has blown the lid off those bounds. It started before he even officially entered the race last June, when Trump implored attendees at a Republican summit in April to resist reforming Social Security and Medicare. During the first GOP primary debate on August 6, 2015, Trump expressed admiration for Canada and Scotland's single-payer healthcare system. A few days later, Trump defended Planned Parenthood during an interview with Sean Hannity. Two weeks later, Trump suggested during a CNN interview that he would raise taxes on wealthy Americans, cleverly labeling it a hedge-fund tax. The following month, Trump signaled his disdain for free trade during a '60 Minutes' interview, telling Scott Pelley NAFTA has been a "disaster." Believe it or not, the list goes on, but I digress. Naturally, the historical nature of a Republican's brazen appeals to populist economic programs often identified with progressives led many political commentators to entertain an interesting theory: might Mr. Trump's overtures to the left pay dividends this November? Articles from Breitbart's Mike Flynn and The Washington Post's Philip Bump highlight Trump's support from a specific kind of Democrat - namely, ex-Democrats. The NY Times' hypothesis was a bit different, though not far off - a big chunk of Trump's support stems from self-identifying Republicans who, for whatever reason, are registered Democrats. Regardless of the theory, beware of misleading headlines suggesting Trump could coast to victory in November on the backs of Democrats; because from the standpoint of general election polling, nothing appears nearly so out-of-the-ordinary. In fact, considering the eight national general election polls (with readily available crosstabs) conducted since the Iowa Caucus on February 1, Trump earns an average of just 9% from self-identified Democrats - essentially the same amount won by his GOP opponents Marco Rubio (9%) and Ted Cruz (8%). In fact, Mitt Romney, John McCain, and George W. Bush all polled better among Demo.crats than Trump during a similar period in their respective 2012, 2008, and 2004 (uncontested) primaries. As the 2016 presidential race progresses, I've given in and decided to try my hand at a bit of electoral projection. True, I'm playing in a crowded field with bigger and better players, but this is mostly for me. Plus, everyone needs a hobby. For starters, this projection will be purely electoral college based, relying entirely on polling and nothing else, as opposed to say FiveThirtyEight, which employs a nifty "polling plus" forecast. Why not just rely on Pollster, or Real Clear Politics, you might ask? While both sites are exemplary, RCP excludes some surveys, and Pollster has yet to start projections for individual states in the general election - not to mention both sites aren't quite as up-to-date with the latest polling information as I would like them to be. At least for now, each state's electoral college projection will be based on every state poll released in the last two months. For example, today's update would be based on polling dating back to December 25, 2015. Obviously, as the pace of general election polling picks up through the rest of the year, the projection will be based on a smaller time frame. Since we're still nine months from the presidential race, very little general election polling has been done in most states, while other states have seen no polling at all. Regarding states that have not had any polls conducted over the last two months, the electoral college projection will be based on an average of the most recent survey conducted after Trump's June 2015 presidential announcement, and any survey conducted within one month of that most recent poll. If there has been NO polling post Trump-announcement, the electoral college projection will be based on an average of that state's 2004 and 2012 presidential election results. I've chosen 2004 and 2012 as a baseline in the absence of any polling because these two elections featured a relatively moderate-to-small win for the two political parties - the Republicans won by 2.5 nationally in 2004, while the Democrats won by 3.9 points in 2012. Pink = GOP lead of less than five points. Light red = GOP lead of five to just-under ten points. Red = GOP lead of ten to just-under twenty points. Dark red = GOP lead of twenty points or more. Very light blue = Democratic lead of less than five points. 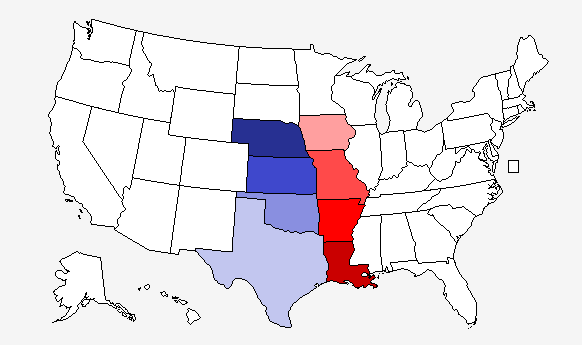 Light blue = Democratic lead of five to just-under ten points. Blue = Democratic lead of ten to just-under twenty points. Dark blue = Democratic lead of twenty points or more. To the chagrin of the sixty-to-seventy-odd percent of Republicans who do not support Donald Trump as their nominee for president, the billionaire firebrand is looking mighty dominant in post-New Hampshire primary polling. But how is he standing up compared to past polling front-runners at this point in the campaign? For Trump critics, the news is pretty bleak, yet not without at least a faint glint of hope. In my experience, it's always best to start with the bad news, so here goes: in nearly every presidential primary since 1976, the national polling leader between the New Hampshire and South Carolina primaries has gone on to become their party's nominee. Specifically, of the fifteen post-New Hampshire national primary polling leaders examined over the last forty years, twelve eventually earned their party's nomination (or 80% of the time). Having said that, Donald Trump is currently the Republican's national polling leader, and by a wide margin. With one day remaining until South Carolinians head to the polls, Trump's averaging 36% support from Republicans across seven primary surveys conducted after the New Hampshire primary, reaching as high as 41% and as low as 26%. He maintains an average seventeen point advantage over his next closest competitor, Ted Cruz. Faced with the numbers, and what we know of history, what else is there to conclude other than the fact that Trump appears headed for the Republican nomination? An unquestionable, and entirely predictable ideological shift in the Democratic Party was confirmed by the Iowa entrance poll on Monday night. The first such poll to be conducted in eight years revealed that Democrats, or at least those willing to turn out for a night time caucus in Iowa, have become decidedly more liberal since their last meeting in 2008. The fact was captured not only in the final vote count, which found a self-professed socialist virtually tied with a former Iraq War supporter, but turned up in black and white in the poll taken of Iowa Democrats as they entered their caucus site. To be sure, there was an abundance of evidence that the Democratic Party was shifting ideologically leftward prior to the Iowa entrance poll. Since Bernie's campaign announcement last April, multiple surveys found a plurality of Democrats viewing socialism favorably - even more favorably then their views of capitalism. Routine political polling from the likes of Gallup and Pew Research also picked up on the increasingly liberal bent of the party. But caucus-goers confirmed the movement, and to an unmistakable degree.